In November 2017, the world’s eyes were focused on the tourist island of Bali, Indonesia, as Agung erupted for the first time since 1963 [Gertisser et al., 2018] (Figure 1). Locals refer to Gunung Agung, the Bahasa Indonesian term for “great mountain,” as Bali’s “great volcano.” This latest Balinese eruption and the ensuing ashfall required some 150,000 people to evacuate the area and caused airline flight disruptions and widespread anxiety. Now that Agung has shown signs of reawakening, it is imperative that scientists understand its inner workings. However, this latest eruption was tame compared to the climactic 1963 crisis, in which fast-flowing, glowing hot debris avalanches killed at least 1,100 people. Sulfur-rich gas emitted to the stratosphere during the 1963 event also caused global temperatures to dip by 0.1°C to 0.4°C [Self and Rampino, 2012]. Now that Agung has shown signs of reawakening, it is imperative that scientists understand its inner workings (Figure 1). Our international research team has taken on this challenge. We collected evidence from chemical analysis of volcanic crystals, which now enables us to reconstruct the magma storage network beneath Agung [Geiger et al., 2018]. We found magma storage areas at both mantle (~20 kilometers (km)) and shallow crustal (~5 km) depths beneath Agung. This type of multilevel plumbing system may be typical of Indonesian volcanoes and could cause magma in shallow reservoirs to become enriched in silica and volatile compounds containing sulfur or hydrogen, thus promoting the frequent explosive eruptions observed in the region. A research team from Sweden, the United States, and Italy collected rock samples from the infamous 1963 lavas of Agung, as well as from the 1963 and 1974 eruptions of Agung’s “twin sister,” Batur. 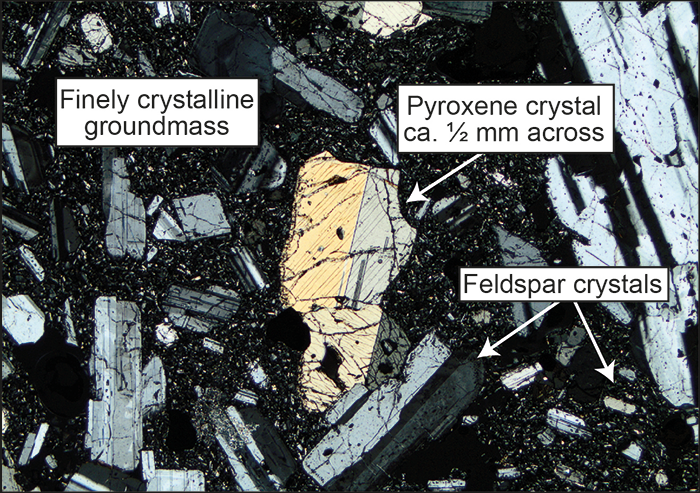 These lava rocks look bland, but when we investigate wafer-thin slices of them under a microscope, a whole world of different crystal types and sizes is revealed (Figure 2). Fig. 2. Lavas from Agung on Bali contain numerous crystals, such as this pyroxene surrounded by plagioclase feldspar (viewed under a polarizing microscope; field of view is approximately 3 millimeters (mm)). These crystals are held in a groundmass (or matrix) made of tiny, barely perceptible crystals (microlites) and glass (former melt). Most of the crystals are close to one fifth of a millimeter in size, but some can be as large as 1 millimeter across. These crystals contain a rich archive of information about magmatic processes under and within Agung volcano. The most common minerals in Agung and Batur lavas are pyroxene and plagioclase feldspar, whose chemical composition varies as a function of the pressure and temperature under which they crystallized. Micrometer-scale chemical data gathered from these minerals can thus be used to calculate their approximate depth of crystallization [Putirka, 2017]. In this way, scientists can make inferences about where magma is stored under a volcano and make predictions about how eruptions are fed, supplied, and, in some cases, sustained for considerable time. Before the devastating 1963 eruption, magma was stored at multiple levels beneath the volcano, within an interconnected network of melt pockets. “Volcano forensics”—studying minute crystalline components of volcanic rocks—has been very useful for investigating Agung and Batur [see Geiger et al., 2018]. Scientists learned that before the devastating 1963 eruption, magma was stored at multiple levels beneath the volcano, within an interconnected network of melt pockets (Figure 3). One of the main storage levels was at the crust-mantle boundary some 20 km beneath the island’s surface. This is likely the region where magma produced by partial melting of Earth’s mantle meets the lower crust and enters large magma reservoirs. These reservoirs probably form at this boundary level because of the density contrast between the mantle and crust. Mantle-derived magma is basaltic—rich in magnesium and iron and relatively poor in silica—but it is relatively hot, and subduction zone systems often introduce volatiles into the magma. This magma delivers a flush of new volume, heat, and volatiles into the plumbing system, sending shockwaves through the crust, which scientists can detect seismically in the form of deep crustal earthquakes. Fig. 3. (a) Schematic model of Batur and Agung volcanoes with their underlying magma plumbing systems based on data by Geiger et al. (map courtesy of NASA). (b) Magma plumbing at Anak Krakatau (Sunda Strait), Merapi (Central Java), Kelut (East Java), and Agung and Batur (Bali) based on literature data presented by Geiger et al. (map courtesy of Google Earth). Note the ubiquitous presence of shallow arc storage systems (SHARCS) throughout the region. Moho refers to the Mohorovičić discontinuity, the boundary between Earth’s crust and mantle. The other major storage level detected at Agung lies within the top 5 km beneath the volcano. A 2012 study used interferometric synthetic aperture radar (InSAR) to observe deformation indicative of a magma body at just a few kilometers depth [Chaussard and Amelung, 2012], and the existence of a shallow magma body has now been confirmed using petrological methods [Geiger et al., 2018]. When magma is stored in the top portions of Earth’s crust, it cools and crystallizes, changing the composition of the remaining melt so that it becomes more viscous and enriched in alkali elements and silica (e.g., basaltic andesite or andesite composition). Silica-enriched magma, in turn, can dissolve greater amounts of water than basaltic magma, but neither magma type can keep a lot of volatiles in solution under the relatively low pressures of the upper crust. These elemental and volatile enrichments in shallow-level magma reservoirs can be further modified by interaction between magma and hydrous crustal rocks or fluids and, in so doing, promote conditions favorable for explosive eruptions. Crystal-based volcano forensics helps scientists to assess magma storage levels and to evaluate the likelihood of future explosive eruptions. Other studies using thermobarometry and InSAR data have revealed that multilevel plumbing systems are likely also present under other Indonesian volcanoes such as Anak Krakatau, Mount Merapi, and Mount Kelut (Figure 3). These observations suggest that shallow arc storage systems (SHARCS) are a widespread phenomenon in the Sunda subduction system. The challenge with shallow magma reservoirs is that it remains very difficult to predict when an eruption will occur. The challenge with shallow magma reservoirs is that it remains very difficult to predict when an eruption will occur. It is important to monitor these volcanoes for signs of unrest, such as increased seismicity that might indicate magma or gas movement in the plumbing system. For example, concurrent deep and shallow earthquakes may indicate replenishment of the shallow plumbing system from depth. In the case of the Agung 2017–2018 events, seismic data from the Indonesian Agency for Meteorology, Climatology and Geophysics (BMKG) initially revealed earthquakes at depths greater than 20 km, which then migrated upward, signaling reactivation of the shallow magma storage system. In 1963, by contrast, the plumbing system at Agung was ripe for a major explosive event, possibly because of the nature of the evolved magma in the shallow crustal magma chamber and the rate and intensity of basaltic injections, which led to a larger and sustained eruption. In fact, repeated injections of basaltic magma from deep in Earth into high-level andesitic magma bodies might have caused magma mixing and violent expulsion of volatiles from solution prior to the devastating 1963 eruption of Agung [Self and Rampino, 2012] as determined on the basis of evidence from magma chemistry, crystal zoning patterns, and observations of partly dissolved crystals. Kelut volcano in Eastern Java exhibited only a few days of increased shallow crustal seismicity prior to a short but extremely explosive eruption. However, processes such as cooling, fractionation, and possibly magma-crust interaction can oversaturate the volatiles in SHARCS, which can cause eruptions from shallow reservoirs that are not heralded by deep seismicity. These processes can cause apparently sudden, erratic explosive eruptions, as likely exemplified by the 2014 Valentine’s Day eruption of Kelut volcano in Eastern Java. This volcano exhibited only a few days of increased shallow crustal seismicity prior to a short but extremely explosive eruption [Cassidy et al., 2016]. Another example is the brief but explosive eruption at Merapi in June 2018. Our research group is currently analyzing recently obtained crystal-scale isotope data. We anticipate that information from these studies and other such emerging volcano forensic techniques will reveal more clues for better understanding the processes and resulting behavior of arc volcanoes like Agung in the near future. Stay tuned! We thank D. Hilton for his earlier contributions to this work and K. Putirka, C. Stein, and an anonymous reviewer for their thoughtful reviews. This work was supported by the Swedish Research Council (Vetenskapsrådet). Cassidy, M., et al. (2016), Volatile dilution during magma injections and implications for volcano explosivity, Geology, 44, 1,027–1,030, https://doi.org/10.1130/G38411.1. Chaussard, E., and F. Amelung (2012), Precursory inflation of shallow magma reservoirs at west Sunda volcanoes detected by InSAR, Geophys. Res. Lett., 39, L21311, https://doi.org/10.1029/2012GL053817. Geiger, H., et al. (2018), Multi-level magma plumbing at Agung and Batur volcanoes increases risk of hazardous eruptions, Sci. Rep., 8, 10547, https://doi.org/10.1038/s41598-018-28125-2. Gertisser, R., et al. (2018), When the gods are angry: Volcanic crisis and eruption at Bali’s great volcano, Geol. Today, 34, 62–65, https://doi.org/10.1111/gto.12224. Putirka, K. D. (2017), Down the crater: Where magmas are stored and why they erupt, Elements, 13, 11–16, https://doi.org/10.2113/gselements.13.1.11. Self, S., and M. R. Rampino (2012), The 1963–1964 eruption of Agung volcano (Bali, Indonesia), Bull. Volcanol., 74, 1,521–1,536, https://doi.org/10.1007/s00445-012-0615-z. Citation: Deegan, F. M., V. R. Troll, and H. Geiger (2019), Forensic probe of Bali’s great volcano, Eos, 100, https://doi.org/10.1029/2019EO115211. Published on 12 February 2019.